This was one of the gifts I received today. I thought it was so sweet I had to share it. 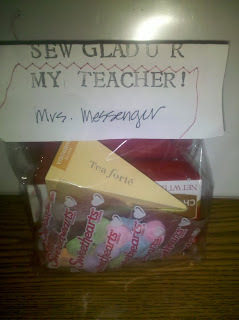 In case you can't read the tag it say "Sew Glad U R My Teacher" and the bag of goodies is stitched shut. Love It!! What a sweet gift!!! Thank you for visiting my blog! I just love the owls...I am seeing them everywhere & the more I see them, the more I LOVE them! !